At the dawn of Space Age, the Soviet Union has already had in place a network of ground control stations, allowing to communicate with the early spacecraft to send commands onboard and process the information received from orbit. As it was the case, with early space launchers, the Soviet command and control network owes its origin to the program of long-range ballistic missiles. The early ballistic missiles required radio commands to be sent onboard constantly to adjust their trajectories in flight. The development of the first intercontinental ballistic missile, the R-7, equipped with radio control, posed immediate challenge before its creators - the extensive network of "measurement stations" had to be deployed under the rocket path in order to determine the vehicle's speed and direction and send flight correction commands onboard. In addition, a number of observation stations was required around the target range in Kamchatka Peninsula, where the missile's dummy warhead was expected to impact during test launches. 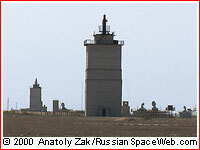 As a result, two groups of command and control stations, known as IPs (from Russian "izmeritelny punkt" or measurement site), would be required. They would spread over a vast distance of more than 6,000 kilometers across the Soviet Union. The construction of such a network became another unknown heroic feat for the Soviet military. Many installations of the network had to be built in the midst of virtually uninhabitable and hard-to-access wilderness, with no even basic accommodations. As it was typical for many Soviet military projects at the time, the government would spare no funds for the engineering infrastructure, but was slow to invest into residential housing. A group of tracking stations responsible for the flight control of the R-7 missile was collectively know as the Taiga region. It included nine IP stations stretched downrange from the launch site in Tyuratam. The second group of stations, known as the Kama region, were responsible for tracking of the warhead reentry over the target range in Kamchatka Peninsula. Both code-names of the regions -- Taiga (wild forests of Siberia) and Kama (a river in northern Russia) were designed to create a confusion about the actual location of the sites. The original command and control station in the network, IP-1, was located at Site 18 of the NIIP-5 test range in Tyuratam (Kazakhstan) only about 1.5 kilometers behind the original launch pad for the R-7 rocket. The instruments of the IP-1 station were distributed over a distance of one kilometer along the ridge dominating the area. Other IP stations were located symmetrically on both sides of the rocket's flight path, with even-numbered stations placed on the left side of the trajectory and odd-numbered stations deployed to the right from the path. Each pair of downrange stations in combination with the IP-1 was creating a giant triangle, and when including a flying rocket - a pyramid. In 1957, IP-4 and 5 stations had a staff around 13 officers and 25 soldiers. At the time, the IP-6 station was the biggest in the group, staffed by 38 officers and 139 soldiers. At the same time, IP stations in the target area (Kama region) were located in two semicircles around projected impact point of the R-7 warhead. The original plans called for the construction of the station near the Pacific shore line, where their maintenance would be easier. However, when experiments showed the possibility of very poor signal during the warhead descent, the stations were planned closer to the target area. The "internal semicircle" of the Kama Region included IP-15, 16 and 17 stations, which were located 36-57 kilometers from the target point. The "external semicircle" included IP-12, 13 and 14 stations, which were spread from 53 to 102 kilometers from the target. In 1956, the Soviet government approved the use of the R-7 missile for the launch of the artificial satellite. The special command and control infrastructure was now required to support the program. On May 8, 1957, the Soviet Ministry of Defense officially ordered to form a "Center on management and coordination of work of complex of means of measurements, communications and unified time service" and 13 detached Scientific Measurement Stations, or NIP. The purpose of the new organization was to control and communicate with the orbiting spacecraft. 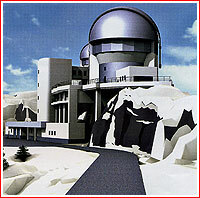 The creation of the center was delegated to NII-4, the leading research institute of the Soviet Ministry of Defense. The center was conveniently located at NII-4 campus in the town of Bolshevo, just one train stop from the town of Podlipki, home of OKB-1, the R-7 developer. The center had a staff of 68 officers and 151 army employees. The entire network was designated as Command and Measurement Complex, or KIK. Major General A. A. Vitruk became the first chief of the KIK network. All tracking of the rocket in flight had to be conducted passively by means of radar, without onboard response, and with the help of ground telescopes. Both optical and radar systems had a limited range and accuracy. Based on experience with the previous launch of the R-7 rocket, Binokl (binocular) tracking system was expected to see the rocket at the distance of up to 200 kilometers. The P-30 radar demonstrated an effective range of 500 kilometers, when tracking aircraft. Its effectiveness was further reduced by slow rotation of its antenna. Optical sensors KTh-41 and KT-50 available in Tyuratam had a range of 100-200 kilometers, also too short for effective tracking of a satellite. Two more powerful KST-80 instruments were available at IP-4 and IP-5 ground tracking stations. In the meantime, at the end of the powered flight, the rocket was expected to be 800 kilometers from the IP-1 station and 300 kilometers from the nearest tracking stations downrange from Tyuratam. When reaching orbit, the satellite would be 1,700 kilometers from the nearest tracking site. Since ground-based tracking systems were limited, flight controllers had to rely on telemetry data from the Tral system in order to confirm the fact that the satellite reached orbit. If stabilization of the rocket would remain normal throughout powered flight and the command to cut off the engine would be issued within accepted time limits, launch officials could celebrate the success. Ultimately, the appearance of the radio signals from the satellite would confirm its release. While in orbit, telescopes of the Academy of Science and radio sensors would help to track the satellite. To support first satellite launches, the Soviet government approved a number of upgrades to tracking facilities and to the hardware originally built for ballistic missile tests. As the original satellite development program was designated Object D, the index "D" was added to the names of systems supporting the mission. On the eve of the Sputnik launch only part of the tracking systems originally planned for the Object D project were ready for work. At the Tyuratam launch site, a special tracking station designated IP-1D was built next to the original IP-1 tracking site during July-August 1957. (70) It was equipped with P-30 and P-20 radar, the SON-2D angular coordinates guidance radar; radio range finder Binokl-D, which was serviced by the personnel from the nearby IP-1 tracking site under command of Lt. N. V. Sachko. 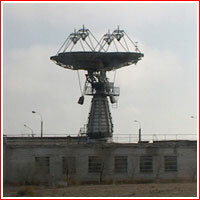 Also during 1962, deep space tracking facilities were introduced at IP-15 in Ussuriisk and IP-16 in Yevpatoria (Crimean Peninsula), while Saturn communication stations were added to IP-3, 4 and 14. The Saturn tracking complex was also deployed at Site 23 in Tyuratam (later known as Baikonur Cosmodrome). 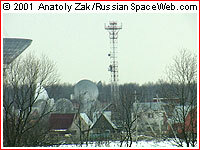 The site, eventually designated IP-5, also received a 12-meter antenna for the Svyaznik (Communicator) complex designed to support Molniya communications satellites. In September 2011, on the eve of the Phobos-Grunt launch, the Svyaznik complex was upgraded to include the Spektr-Iks telemetry complex. Despite a relatively small size of the antenna, the latest highly sensitive hardware promised to enable the control of deep-space probes up to a distance of several million kilometers, according to Roskosmos. In 1960, as the Soviet space program was just taking off, a number of sea-based measurement stations were added to the NIP network. These stations were deployed onboard three oceangoing ships, named Krasnodar, Ilichevsk and Dolinsk. V.G. Bezborodov, the First Rank Captain, became the first chief of this command and control fleet. During 1965 and 1966, Bezhitsa and Ristna command and control ships replaced older Krasnodar and Ilichevsk. One command and control ship, Marshall Nedelin, joined the fleet in 1982 and Marshall Krylov in 1986. Four airborne measurement stations were also introduced in 1974. Three of them were deployed on Ilyushin-20RT planes, based on Il-18 four engine propeller passenger planes. From 1970s, the top-secret Galitsino-2 control center, located in the town of Krasnoznamensk northwest of Moscow, became a nerve center coordinating and managing the vast network of ground-, sea-based and airborne control facilities in Russia. 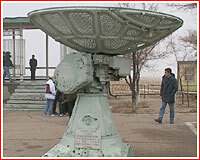 On Dec. 24, 1969, satellite-watching radar stations in Balkhash and Irkutsk were declared operational. During 2009, in the course of restructuring of Russian space forces, a new Detached Measurement Site, OIP, was formed in the Kaliningrad Region (Oblast), Oleg Ostapenko, the commander of space forces told the Russian press. A shift of flight controllers conducted their first communication session with the spacecraft on June 12, 2009, and from September 1 of the same year, the site had started experimental operations. (371) The establishment of the site apparently extended range of the Russian satellite tracking network to the West to the maximum extent possible from the Russian territory. The site probably compensated for the loss of tracking facilities in the former western republics of USSR in the wake of its dissolution. 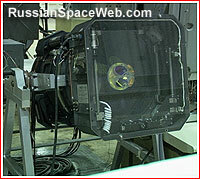 As of 2012, Russia deployed a network of five laser stations intended for tracking and control of orbital vehicles. With the collapse of the USSR, Russian companies found themselves paying to the Ministry of Defense for the control of their non-military, commercial satellites. As a result, some of them decided to fund internal control facilities. NPO PM opened a control facility for Gals and Ekspress satellites on Jan. 20, 1994. Central Command and Measurement Point, TsKIP, code-named Zheleznogorsk, was located at the Paseka site in Eastern Siberia, probably within the campus of NPO PM (later ISS Reshetnev). In 2012, the center received a six-meter antenna of the Klen-A command and measurement complex, which was responsible for flight control of Elektro-L satellite, among several other facilities at the site. TsKIP Zheleznogorsk was a part of the Roskosmos' Unified State Automated Ground Complex for Control of Satellites or NAKU. 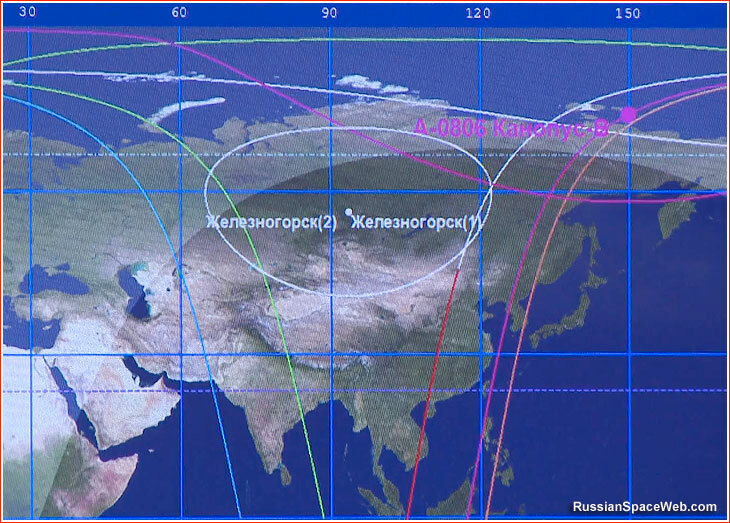 A map showing communications range of the Zheleznogorsk tracking station for the Kanopus-V satellite. In June 2013, GRTs Makeev, the developer of submarine-based ballistic missiles, announced a deployment of a 3.7-meter antenna for the KIP facility at the company's campus in Miass, as part of the Istochnik-M telemetry receiving and transmitting station. The facility would support mission of launch vehicles and civilian spacecraft for Roskosmos, including ISS, GRTs Makeev said. Beginning in the fourth quarter of 2013, the same facility would start deploying a nine-meter, S-band antenna for long-range communications, the announcement said. 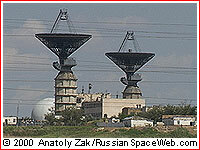 In the wake of the summit between Russian and South-African presidents in September 2006, head of Federal Space Agency, Roskosmos, Anatoly Perminov, (who accompanied President Putin on the trip to South Africa) said that Russia had considered the construction of a ground control station on the South-African territory. On the eve of the Phobos-Grunt mission, the South Africa reportedly invited the spacecraft's developer -- NPO Lavochkin -- to take advantage of the existing site at Hartebeesthoek, however, the company reportedly insisted on the construction of brand-new stations in Namibia or Mozambique. Hopes for opening a South-African site were rekindled in November 2012, when an intergovernmental committee on trade and economic cooperation prepared a ground work for an agreement to use the existing South-African ground station for communications with the Spektr-R observatory during a southern portion of its orbit around the Earth. The final document was promised to be signed during a summit of BRICS countries (Brazil, Russia, India, China and South Africa) then planned in March 2013. A mission control center designed to support the International Space Station and unspecified future space operations. On Feb. 20, 2018, Moscow-based RKS Holdings announced a plan to build a receiving station in Antarctica, which would allow remote-sensing satellites in polar orbits to downlink their data to be transferred to the NTs OMZ center specialized in the distribution of information from the application spacecraft. For Russia, it would be the first ground station for the Integrated Remote Sensing Information Distribution Network, ETRIS DZZ, in the Southern Hemisphere. According to RKS Holdings, the new station will give satellites an extra opportunity to free their onboard memory, which should significantly increase the observable areas on Earth and accelerate the delivery of the remote-sensing data to the end users. Scheduled for opening in February 2019, the new ground station will be situated on the hilltop near the Progress scientific station. The facility will include an antenna complex under a radio-transparent dome and the container with receiving and transmitting equipment. RKS Holdings said. A Soviet Iluyshin-18 aircraft configured to maintain communications with spacecraft.